Explore the effects that colour can contribute to your image. Learn to recognise those colours that enhance your appearance and how to co-ordinate the colours for greatest impact. Colour consultancy was perfected in America to cater for the aspirations of corporate business personnel and to provide a powerful visual message to project a corporate image to the public, e.g. the colour red and Virgin. 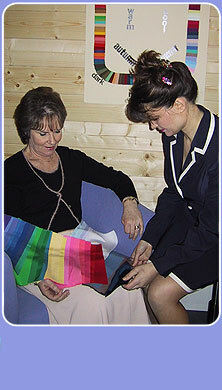 The client will go away with a wallet of personalised colour swatches.